From left to right: winning students Joe Goldin, Alisia Martinez, Jeremy Saal and Brent Hickey with psychology professor Nick Davidenko. Not pictured: Azad Balabanian. Goldin demonstrates FocusVR, a study app that harnesses the Oculus Rift, an innovative virtual reality headset. 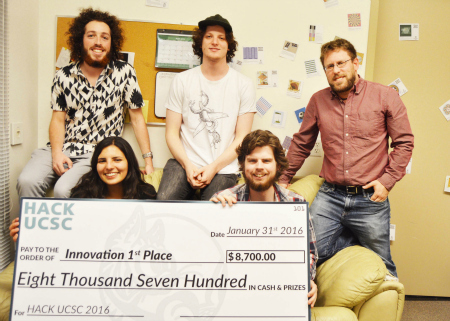 On January 29-31, 550 undergraduates competed at Hack UCSC, an intensive two and a half day coding marathon. Included in the crowd of aspiring developers, designers, and entrepreneurs was a team of student researchers from psychology professor Nick Davidenko’s High Level Perception Lab - who won first prize in the innovation category. 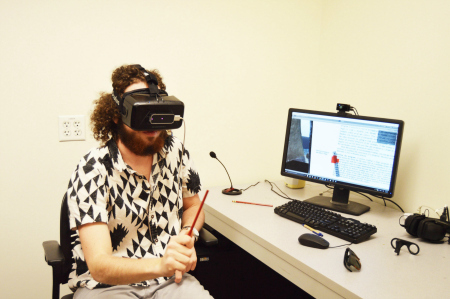 Their project is called FocusVR, and is a virtual environment where people can customize their own distraction-free study space. The winning team are students Azad Balabanian (cognitive science, Stevenson, ’16), Joe Goldin (computer science game design with a film and digital media minor, College 9, ’18), Brent Hickey (computer engineering, Crown, ‘17), Alisia Martinez (cognitive science and computer science game design, Porter, ’18) and Jeremy Saal (cognitive science and computer science, Kresge, ’17). The group met while working for Davidenko, assisting him with his research studies in perception, cognition, and virtual reality (VR). The lab is also home to an Oculus Rift, an immersive virtual reality headset set that is innovating the VR space. The device is only available to developers and is set for consumer release in March 2016. It is exciting for students to work with it. “The High Level Perception Lab is the only cognitive science lab on campus using VR for research,” says Balabanian. “It feels like we are early dot commers,” says Goldin, who is exhilarated by the opportunities in this up and coming field. Team members Saal and Balabanian took Ben Storm’s Learning and Memory class (Psych 129), and it was thanks to Storm’s course that the team found their idea. “We were inspired a lot by the concepts Professor Storm presented,” says Balabanian. “By joining cognitive research with cutting edge technology, we created something totally unique,” he adds. In forty-eight hours the team developed a prototype that simulates different study spaces rooted in key psychological theories discussed in Storm’s class. They drew on concepts of state dependent learning and encoding variability, theories that look at how your study location can affect how well you perform on the test afterwards. If your environment can influence how you learn, why not simulate the best learning environment possible, the team asks. “We chose a beach because many people associate it with relaxation, and relaxation leads to improved focus,” says Saal. There are even opportunities to create a study space that is impossible to achieve in real life. “We designed the “grid” for people who are very easily distracted. The visual environment is very regular and plain and has a white noise sound to further reduce external stimuli. This type of environment is a very powerful tool because it is almost impossible to achieve in real life.” says Saal. “FocusVR can be like a personal tutor,” Hickey adds about the program’s potential. For example, the program could use eye recognition technology to detect how long you’ve lingered on a page and then readjust environment settings. It could also recognize when you need to take a study break and offer breathing and brain exercises. Thanks to their winning prize, a combination of cash, start up services, office space, and hosting services, the team can further develop their prototype. “Professor Davidenko is so supportive of all of us, and it's really nice to see how happy he is with our work. He cares about the results of every experiment, which in turn gets everyone else excited about it. I'm so grateful that he brought such a good group of people together, and I can't wait to continue this project further.” says Martinez.